Esri and The Associated Press, the world's leading news organization, have developed a powerful, easy-to-use online mapping service called MapShop that will change the way consumers around the world view and interpret the news. The MapShop Solution, developed with Esri's ArcIMS, is a system of integrated components consisting of analytical mapping tools and data services that can be used on the Internet and the desktop. Users can benefit from timely and accurate geographic map data and content, from global events to local street-level detail, providing a completely new way to create all types of news and map graphics. Right: Building on ArcIMS, MapShop provides numerous ways for graphics personnel, database editors, and journalists to generate mapsreducing the amount of time it takes to create a new map from hours to minutes. "MapShop meets the growing demand for visually exciting and more accessible news with data-rich graphics," says Tony Lugo, cartographic editor, The Associated Press. "MapShop gives news organizations a quick and easy way to produce information-based maps for news stories. With MapShop, news organizations can provide timely, detailed maps of election results (see "USA Today Uses GIS for Election Mapping"), census results, natural disasters, pollution, urban sprawl, and more." Building on ArcIMS, the MapShop solution provides numerous ways for graphics personnel, database editors, and journalists worldwide to generate maps. A user can define an area of interest by searching for a place name, matching an address, entering latitude/longitude coordinates, or by zooming to the desired area of a map. MapShop allows a user to add layers of information, such as boundaries, roads, rivers, towns, satellite imagery, or shaded relief, in addition to symbols and markers. MapShop provides a rich set of map tools that enable design preferences to be saved and stored, so a graphics designer at a newspaper can archive maps and update them when necessary. Once a user selects the necessary data layers and generates a map, the graphic can quickly be downloaded to the user's computer in many formats used by news organizations around the world including EPS, GIF, JPG, PNG, and SHP. In addition, MapShop allows users to accomplish additional design work using leading graphics software packages such as Macromedia FreeHand and Adobe Illustrator. MapShop provides a wealth of geographic data services that are the most up-to-date and accurate available. Users have detailed information that describes exactly where the data services come from and when it was generated. Working with leading data suppliers in both the public and private sectors, MapShop provides U.S. and Canadian seamless street-level data, dynamic weather data, imagery, shaded relief, demographics, and census data. This gives users tremendous power to do more with geography than provide location; information-rich maps bring stories to life. For instance, when an earthquake strikes, a user can map where it happened, then overlay information about fault lines, previous earthquakes in the area, shaded relief, emergency response locations, and more. MapShop reduces the amount of time it takes to create a new map from hours to minutes and provides unprecedented access to digital geographic and tabular data that, until now, was difficult to integrate with graphics programs. Why? Expensive hardware and software, as well as lengthy data conversion issues, made it impractical; maps that were generated usually provided a visual context to a story, but more often than not there was no real information displayed in the map. With MapShop, users can generate maps that increase the understanding of the story by the reader. With the flexibility of ArcIMS, MapShop brings the power of information and geography to a new level of performance at a fraction of the cost of existing solutions. What might have taken hours to produce, or would simply not have been feasible in the past, can now be done quickly, easily, and at an affordable price. Additionally, data maps convert to any format a newspaper might want. Graphics departments can save money, reduce production time, and improve their publication's impact with world-class map graphics based on geographic analysis. Newspapers can leverage existing digital system resources across departments as well. For many newspapers, computer-assisted reporting (CAR) teams, database editors, and graphic artists operate independently of each other. CAR professionals research and scrutinize volumes of information, often with geographic content, to create their compelling stories. Often, the graphics department must then re-create the maps created by CAR so that they may be placed in the newspaper. MapShop serves as a mutual resource to both CAR and graphics departments by providing the data behind the maps in an environment accessible to both departments. Data from CAR departments can be mapped and augmented with a graphics department's particular style and preferences. In other words, newspapers can create maps that include valuable visually appealing content that conforms to their standard styles and preferences. Above: Newspapers can create visually appealing and informative maps. "MapShop was designed with the entire newspaper in mind," says Lugo. "We developed a highly intuitive interface so that graphics staff, database editors, computer-assisted reporters, and editors would all be able to begin mapping quickly without a lot of training. Anyone on deadline can create a map for a breaking news story and download it in minutes." MapShop can be used in all parts of the newspaper. A site license gives access to everyone at that newspaper. Some newspapers are already including maps in ads and charging advertisers more for the service. 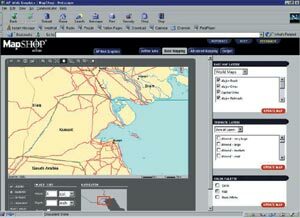 Additionally, MapShop is bundled with Esri's ArcView 8.1 and includes online training via Esri's Virtual Campus. This software can be used with proprietary data to analyze the newspaper's market or find the most efficient way to route carriers, for instance. The Business-side applications can make the service pay for itself, or even make a profit. "We're excited about this new service being offered by the AP and utilizing ArcIMS," says Lugo. "Phase one of MapShop will be available in early 2001 with subsequent enhancements, including Census 2000 data and functionality, following soon after. The feedback we've received has been terrific, and we think MapShop will have a positive effect on increasing the use of maps in the media far into the future." Founded in 1848, The Associated Press (AP) is the world's oldest and largest news service, providing text, photos, graphics, audio, and video to more than 15,000 news outlets worldwide. The not-for-profit membership cooperative has 3,700 employees serving 1,700 newspapers and 5,000 radio and television stations in the United States, as well as 8,500 newspaper, radio, and television subscribers in 112 countries. More than one billion people around the world each day read Associated Press-driven news. For more information, contact Brian Harris, Esri (tel. : 909-793-2853, ext. 1-2643; e-mail: bharris@esri.com).